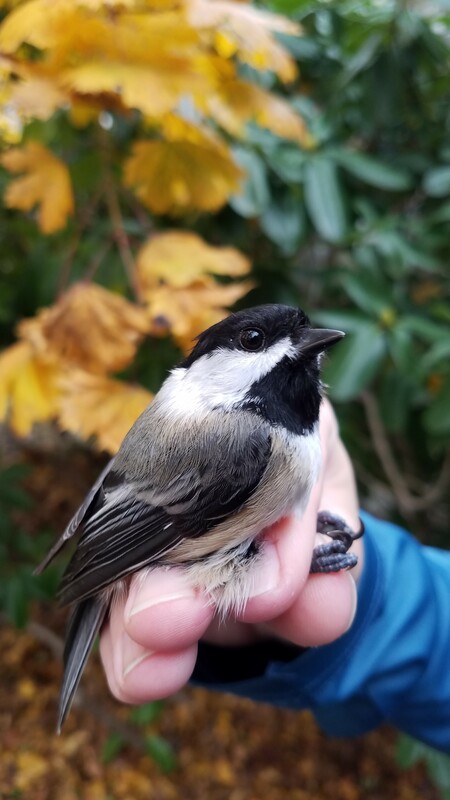 The Fall 2018 banding season has come to a close! In our three months at Manomet we banded 1,470 new birds and processed 910 recaptures of 72 different species. Wind, rain, and cold temperatures made our last week difficult. Monday was our only day of banding where we had 3 new birds and 9 recaptures. 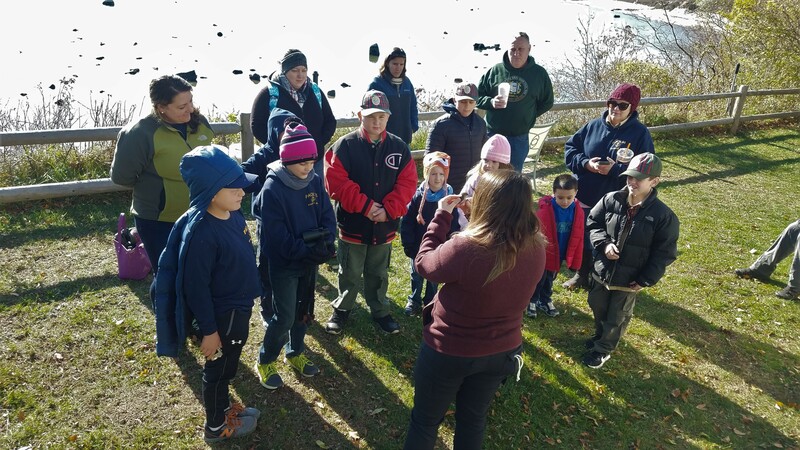 The slow day was invigorated by a visit from the Cub Scouts who were shown seals off the bluff, talked to about wetland ecosystems, and saw several species of birds. On Tuesday, heavy rain from an intense storm brought Northern Gannets careening in close to shore along with Black-legged Kittiwakes. Spring Peepers once again emerged to take advantage of the temporary warm rain. However, bitterly cold air moved in overnight and took hold Wednesday, when we began to take down nets. Looking back on the fall, weather was likely a contributing factor to an average season based on the number of birds banded and the number of species caught. Around 19 inches of rain fell in the area, with 12 inches alone falling between September and October. Windy weather also impacted how often nets were able to be open. Despite the challenges presented by rain and wind, our best days of banding occurred in late September to late October. The majority of birds we banded during this time included Blackpoll Warblers, Swainson’s Thrushes, Hermit Thrushes, White-throated Sparrows, as well as Ruby-crowned and Golden-crowned Kinglets. In general, lower numbers of Neotropical wood-warblers such as American Redstart, Black-throated Blue, Common Yellowthroat and Black-throated Green were banded this season than in the last 10 years. Usually, the most common capture, the Gray Catbird fell from this honored position to the Blackpoll Warbler for the first time this has happened since 1971 – 272 new Gray Catbirds versus 307 Blackpoll Warblers were captured this fall. 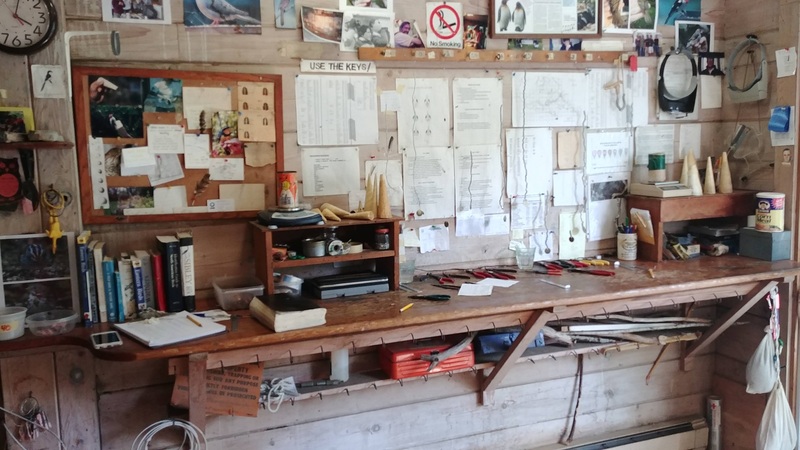 Based on the 10-year fall data, above average numbers of Swainson’s Thrushes, Brown Creepers and Ruby-crowned Kinglets were also banded this season. Some of the more uncommon highlights of our season included 8 Northern Saw-whet Owls, 2 Eastern Screech Owls, 2 Bay-breasted Warblers, a Northern Mockingbird and a European Starling. An important part of bird banding is the recapture of previously banded birds. Two birds that were banded in 2013 were recaptured this fall, a Northern Cardinal and a Black-capped Chickadee – both now 5 years old. These recaptures highlight the high quality habitat at Manomet and site fidelity of birds, which would otherwise be a mystery without bird banding. Also recaptured was a migrating female Blackpoll Warbler that was first banded at Manomet in 2016. In addition to our great banding season we also enjoyed educating several groups of visitors. Around 100 total visitors visited the banding lab over the course of the fall season, including local birding groups, homeschoolers, high school and college classes. As the weather turns colder these next few months, there’s nothing to do but wait, stock the bird feeders and listen to the gentle trills of Dark-eyed Juncos and White-throated Sparrows as they forage in the leaf litter. Until the great journey north begins again in the spring. For a week by week look at the Fall 2018 banding season, click here.